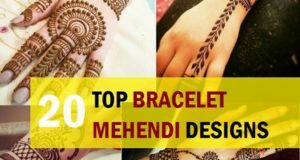 Are you looking for the new and trendy floral mehendi designs for the year 2017. 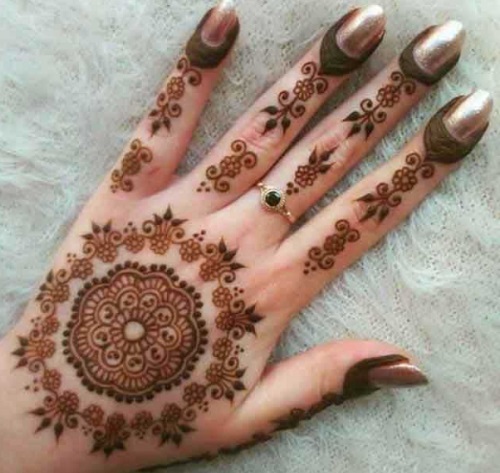 Mehendi and application of henna is an age old thing. 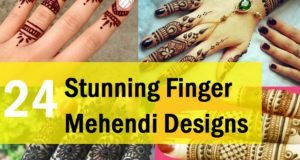 People use to apply henna to adorn their hands, faces, feet etc but now days, mehendi has become an art where beautiful styles are made on the palms, hands, arms, feet and all. These days the patterns are innovative and trendy. Today, we will share the floral mehendi patterns that will surely help you in getting attention. 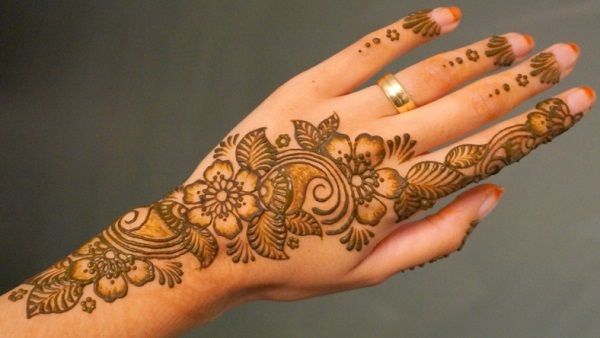 Floral motifs include flowers which decorates the mehendi design. 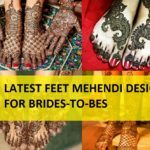 So, here we have compiled this collection of latest floral mehendi designs that can be tried by brides and groom for wedding and in fact by everyone for the festivals like Diwali, Eid, etc. 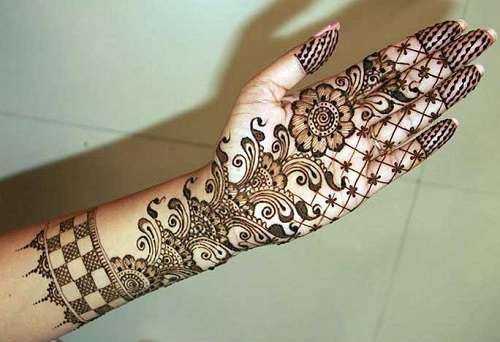 Floral patterns of mehendi are also inspired by the Arabic, Mughlai, Gulf, Indian and other cultures as well. 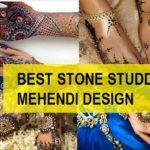 One can also try using floral mehendi designs with stone and glitters. Such things will further accentuate the beauty of a design. 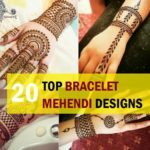 Other designs that are also popularly mixed with floral patterns are the circular tikki design, bail style, ringlets, leafs, Geometric designs, Vine style, parallel line etc. A flower deign that has been made with natural strokes. There is no symmetry in the petals and leaves as such but it looks very natural. Try it with shimmer and glitters to make it more alluring. 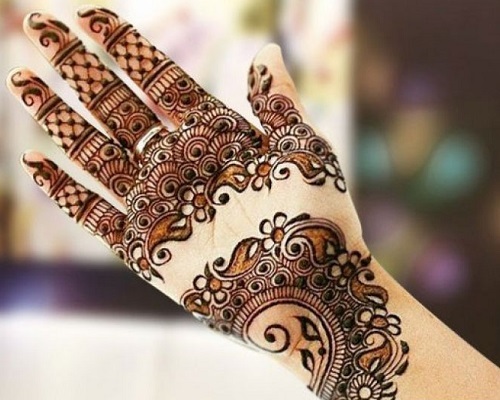 It appears more like a tattoo as the mehendi color is quite black in contrast with the natural dark green or dark red color. 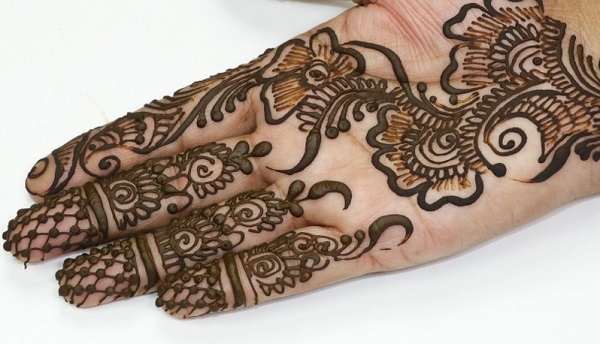 There is precision in this design as the thin fine lines are made with so much intricacy. There are drawn in such a way that even though they are really close they do not merge anywhere. The complexity is the beauty of this floral structure here. Enticing and amazing design!! 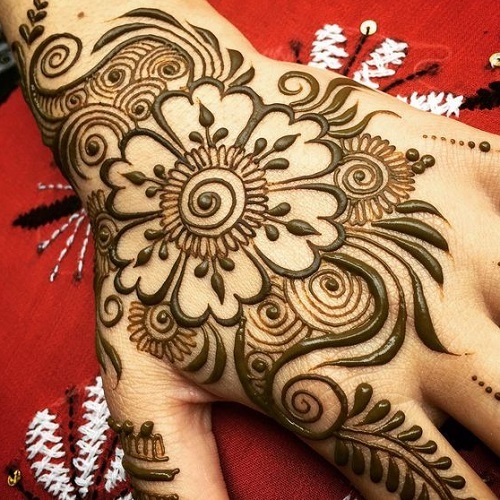 The design has the blend of a beautiful flower design of mehendi along with a different spiral motif which looks alluring. 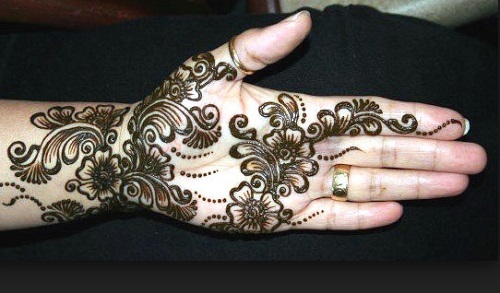 The fingers are covered with the ringlet like design and dotted flowers. It is very delicate in appearance. 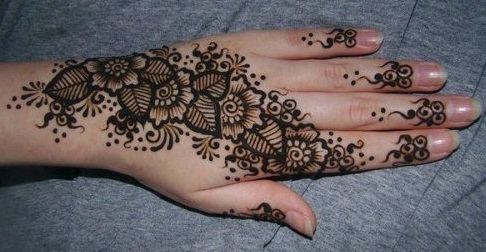 Here you will see the spiral with floral patterns. 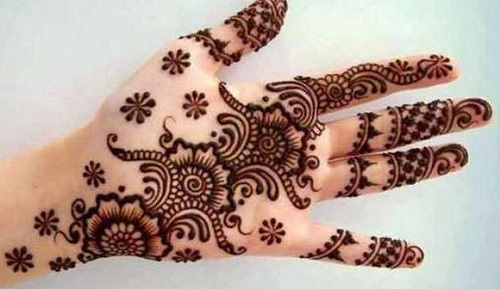 The design at the fingers too is dainty and easy but actually makes this a beautiful arrangement of patterns. Flowers with parallel veined leaves! 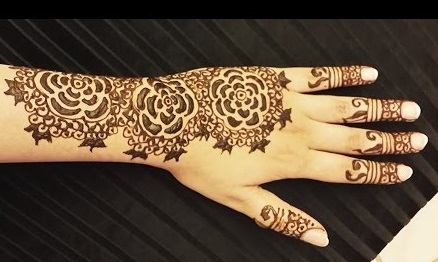 We have seen a design similar with that earlier but here the shading is not there but rather the floral mehendi design is kept quite simple and feels very traditional. This pattern is very carefully made with the thick and thin lines and extra precautions have been taken to keep the lines of same width and that they do not mingle. 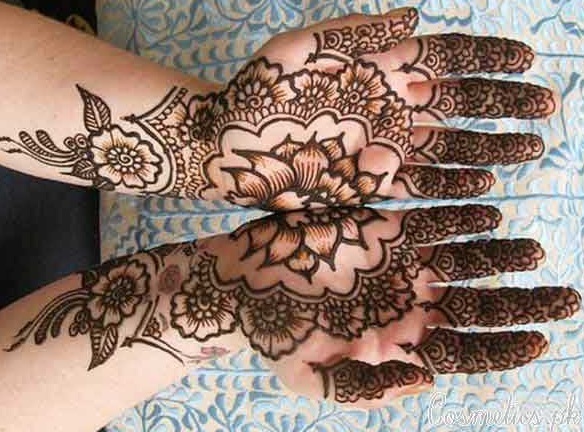 The design is filled with floral motifs here and there which elevate the beauty of this crisply made peacock mehendi design. 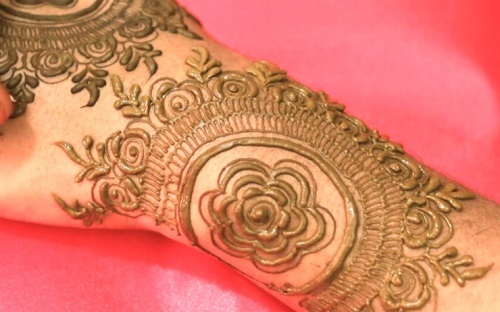 This mehendi is made with only floral pattern. Paisleys with floral design over one another is the time of this design. 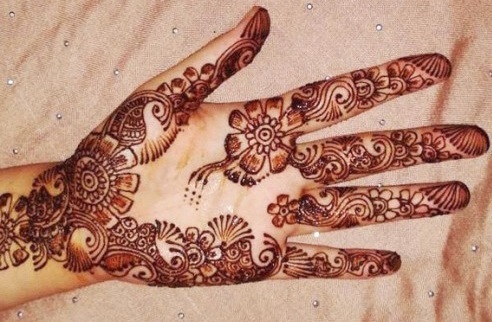 The design is not like the usual single line mehendi design but it extends on the first two fingers. 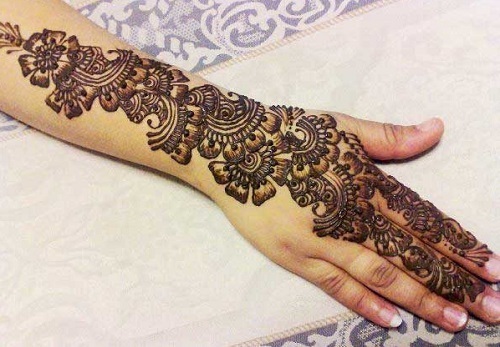 This design can be referred as a floral mehendi design amalgamated with geometric patterns. The parallel crossing lines makes a lovely design along with a cuff like structure at the wrist area. 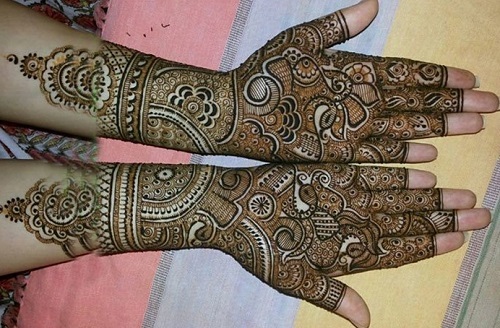 This is a fusion design that incorporates the delicate small paisleys along with flowers. 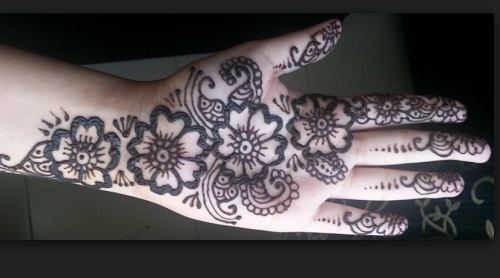 This is a shaded design of mehendi too. This is very different and the arc like shape is also adding charm to this spectacular design. Here is this designs the dots, paisleys are taking over. 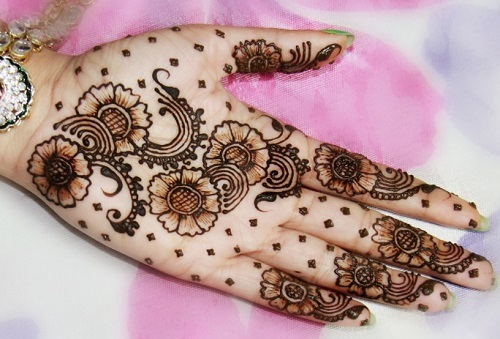 The flower shapes are of multiple sizes that joins the entire design of mehendi on the hands. 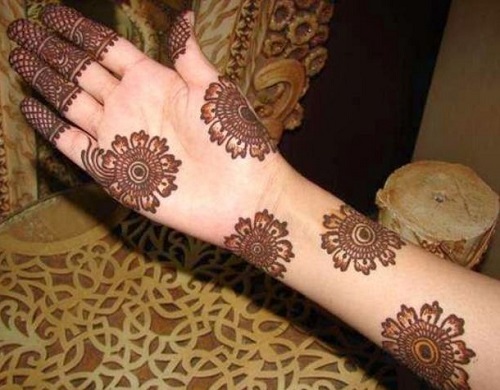 In the middle, there is single line mehendi pattern with similar design on the fingers and thumb. 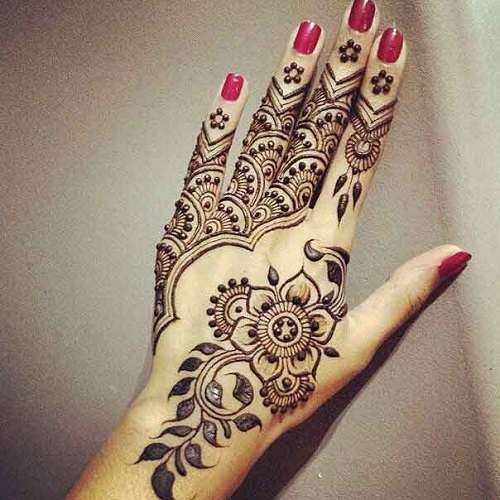 This is not just a mehendi design bit it looks more like an embossed or wooden carved out design. 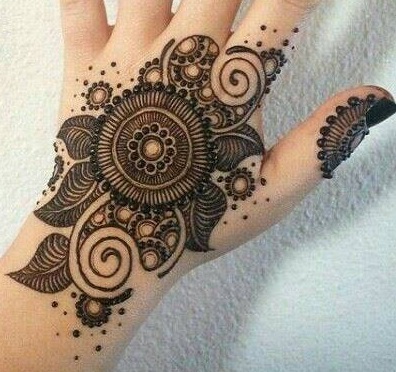 It looks very unique and also has that Arabic inspired mehendi design feel. 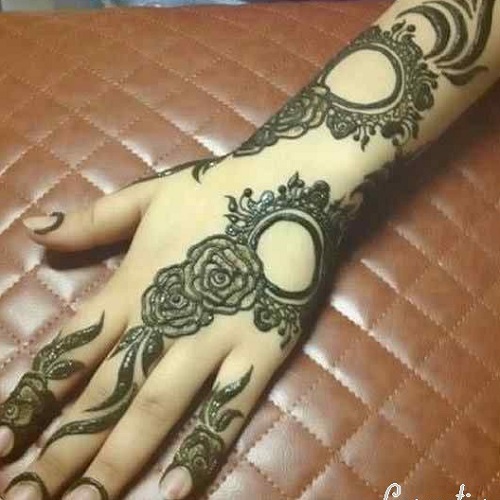 We would surely recommend that you try such designs and be different. Flowers can be stacked together to make a pretty banded design which runs from wrist to the fingers. 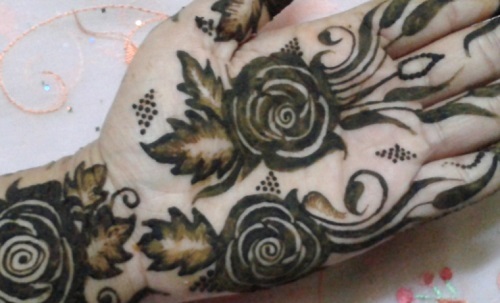 It looks elegant and is easy to draw if you like drawing mehendi yourself. This design can be referred as a neat and simplistic design. 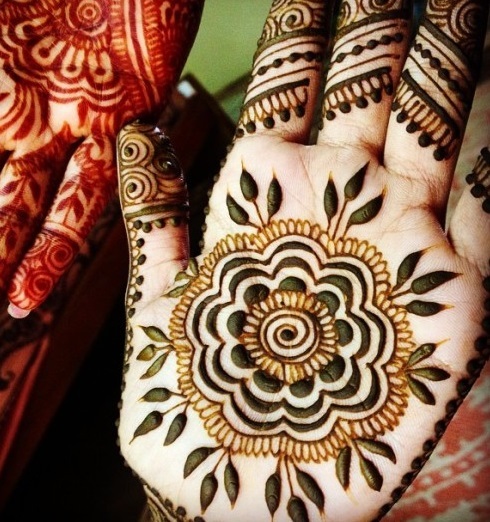 It is so symmetrical in appearance that it looks as if it is made with a pattern maker or block for mehendi. 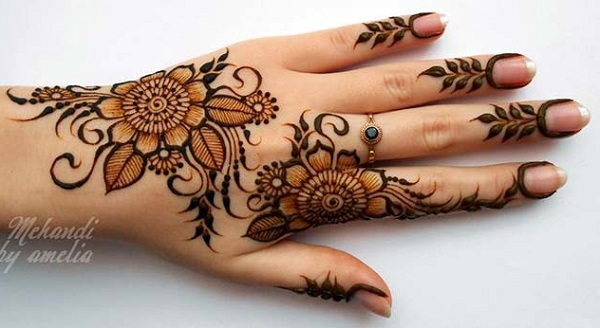 The small flowers and their leaves which are joined perfectly in a intertwined manner which encase a huge flower motif in the center of the hands is a beauty to look at! This looks like a glass painting that we do. The Rose flowers along with their leaves look attractive. The ringlets in between fills up the extra gaps and space to make this pattern look rich. 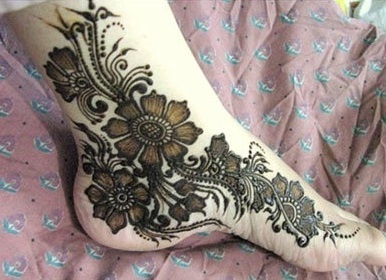 This gorgeous pattern on the feet is alluring and is the best of the floral designs for the feet. You can also try it on the back of your hands. Flower with a heart and some dots scattered here and there in ringlets and spirals. 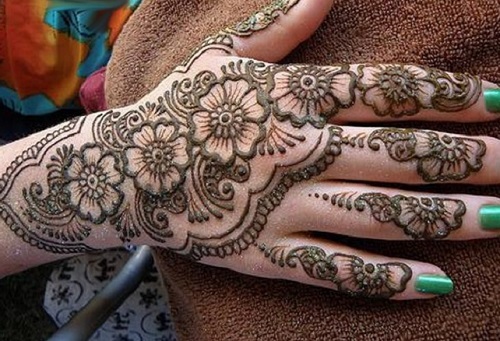 This again is a lovely floral mehendi with lots of flowers and leaf like designs. Here the floral design is a bit wide apart and not too close like the earlier designs. But isn’t that looks pretty? Young little girls can apply this as well. Big 5-6 petaled flowers with thick borders are the highlight of this design. 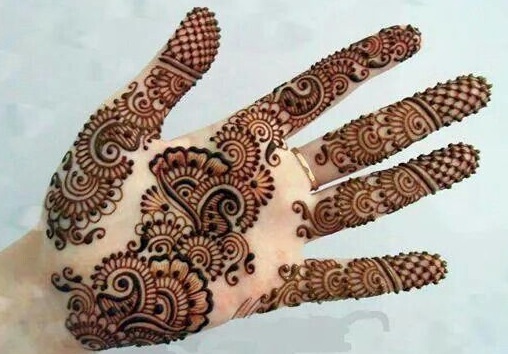 The flowers go in a line and decorate the palm. 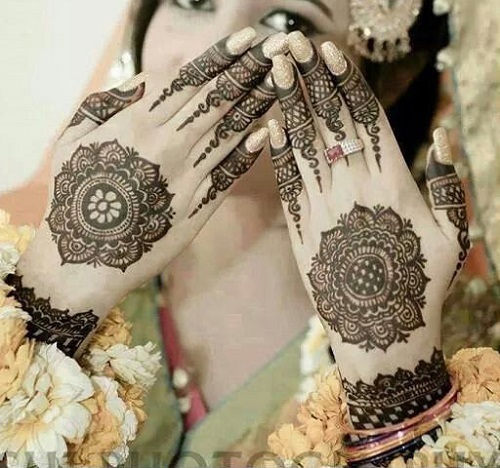 Here the flowers are on the entire palm they are adjoined by the dew drop and curvy shapes that also make the flower look pretty. 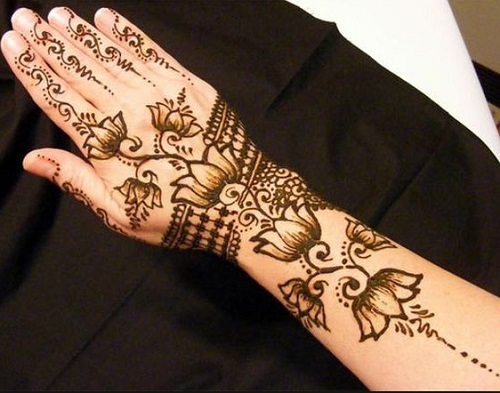 This design is filled with small flowers of multiple shapes and sizes. There is a chequered design on the fingers which makes this a bit different. 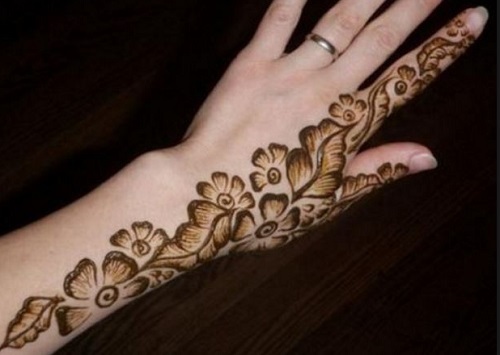 Very thin and softly made nice floral design. 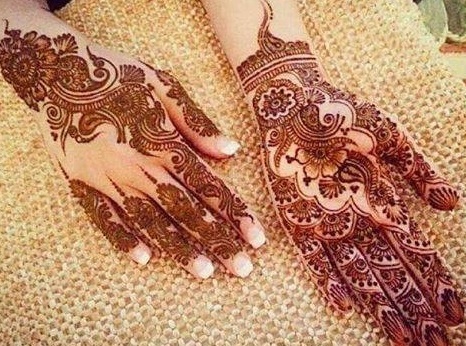 This has an appeal of the modern Arabic floral mehendi. 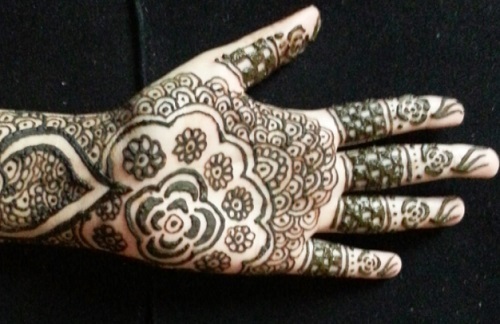 Little bit of mehendi shading is also done with light handed strokes. 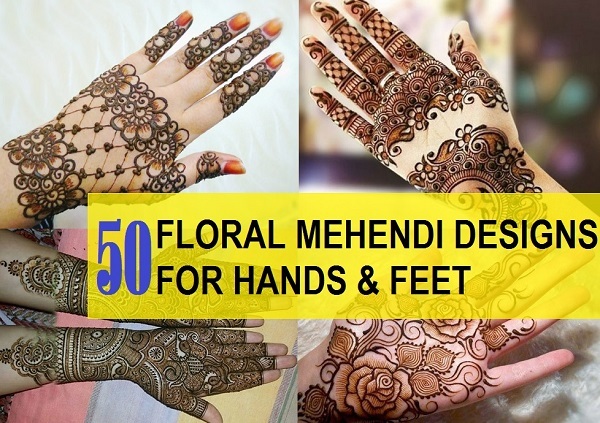 Lots flowers are also used a lot when in comes to floral mehendi designs. 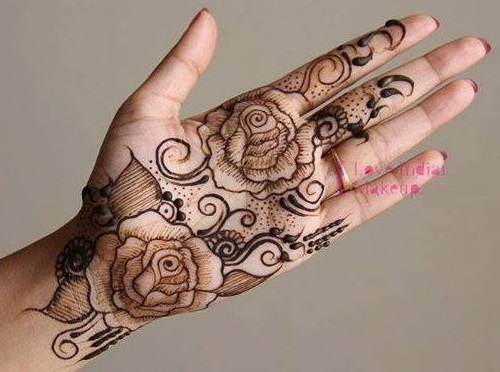 Here there are group of 4 lotus flowers that decorates the back of the hand mehendi. It looks like a floral inspired painting. The thick borders of the flowers make a lasting impression and are also shaded further. 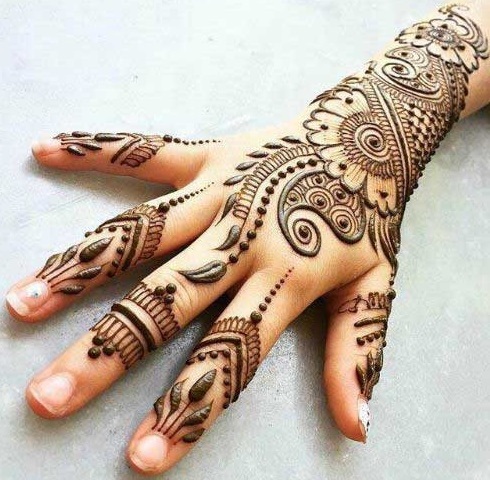 Such mehendi designs look lovely for any occasion and festivals. Three roses which appears to be carved out! 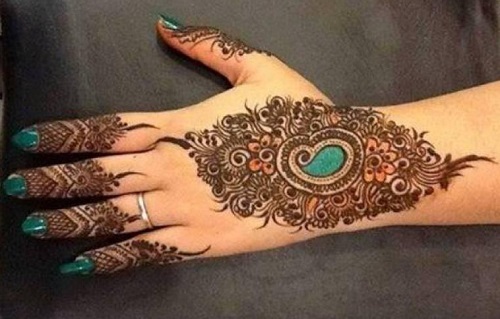 It is royal and very Mughal era inspired mehendi design. One of the best and very different designs that is seen on the clothes but here the design is blue printed on the palms. 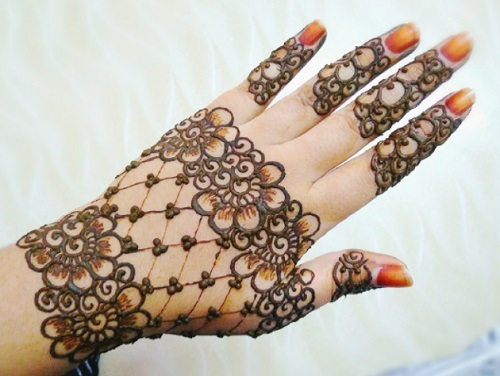 The multi-petaled flower is placed wide apart on the palm and the gaps are also not filled with other shapes. This gives a modern and traditional feel simultaneously. 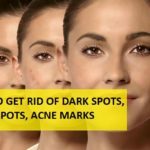 One should definitely try it for Eid, Karwa Chauth and festivals like Diwali, Dusshera etc. 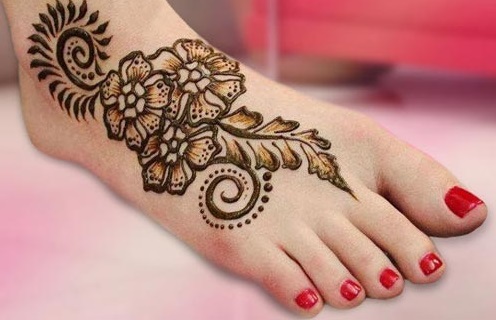 Another beautiful feet mehendi design that includes nice flowers and spirals. This is also an intricately done design which has charming flower on the wrist and the design that goes further with paisley motifs. 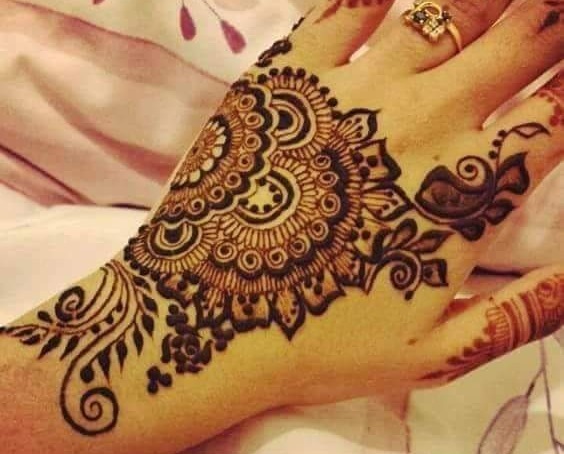 The design on the fingers is rich and charming. It is really a rich and attractive looking design. 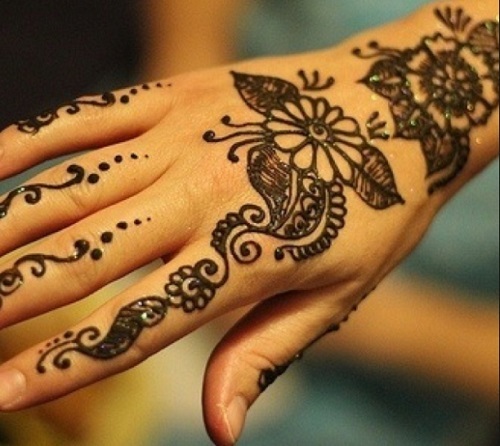 Such a simple design which is also popular as a tattoo! 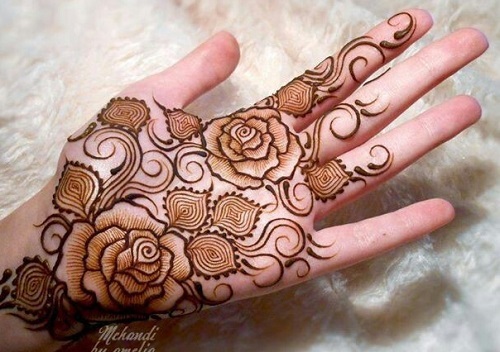 If you like arm mehendi then do try such floral mehendi. The way kids will draw roses on their drawing books, similarly this flower design is enticing. The neatness is visible and so does the artistic appeal. 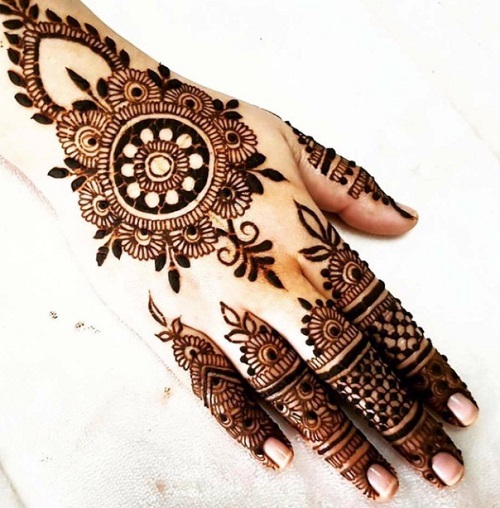 This one is a true floral design mehendi where the floral are studded in a bunch that actually hugs the main shape which is a structured paisley. It is unique and different. Floral motifs have become quite popular and girls are loving them. 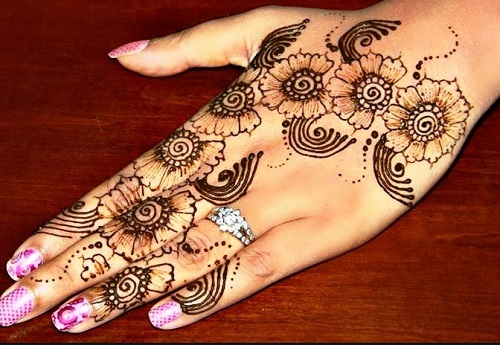 To make your henna design look intricate and trendy you should try using floral patterns in them. 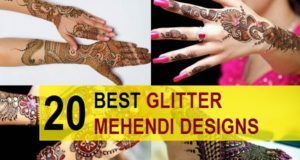 It is not just that these will give a rich new look but also gives a fresh feel to your mehendi design. 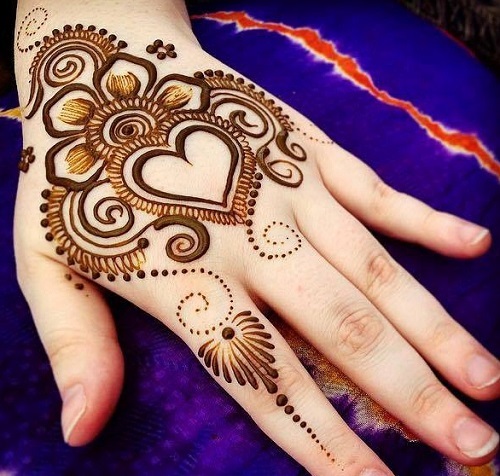 Check out some more floral mehendi designs. 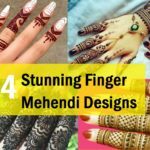 These were the fresh and new Floral mehendi designs and patterns for the year 2017-2018 that ladies can try. 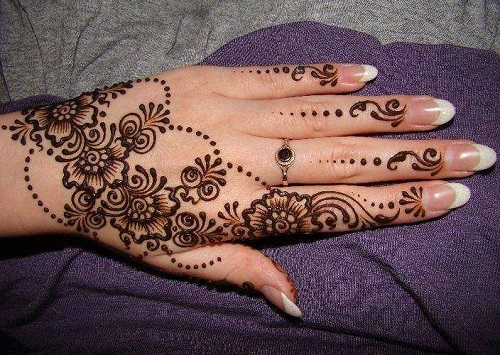 Henna application is an art that gives beauty to the hands. You can wear fashionable ensemble to look your best. 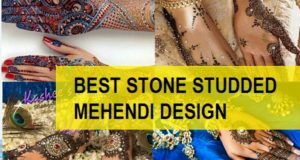 Which is the design that you loved? 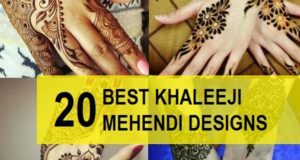 Previous: 20 Best Single Line Mehendi Designs for you to Try! 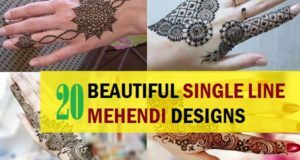 20 Best Single Line Mehendi Designs for you to Try!